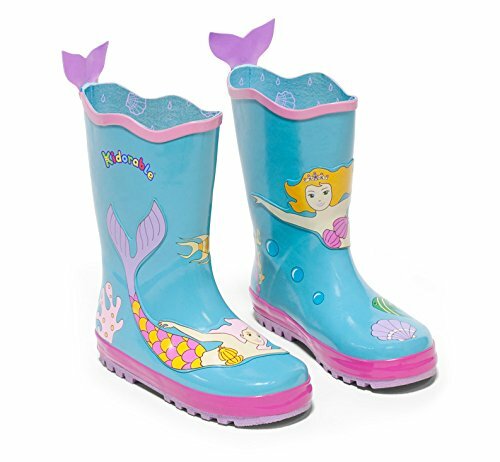 Kidorable Blue Mermaid Rubber Rain Boots are available in children’s sizes 5-13, plus young adult sizes 1 and 2. Like all Kidorable boots, they have a fun, comfy cotton lining and custom non-slip sole. To complete the outfit, get a matching Kidorable Mermaid umbrella, coat, backpack, knitwear and more! Most Kidorable products are designed for children aged 2-6. Many of our products are available for babies, and children as old as 11. Kidorable delights both children and the adults who love them by transforming everyday, functional kids' accessories into objects that excite their imaginations and enrich their lives at play. Find the gear your kids will actually beg to wear. Raincoats, Rain Boots, Umbrellas, Backpacks, Hooded Towels, Hanger Sets, Knit Gloves, Hats, and Scarves, and more. Here you’ll find styles to spark any kid’s imagination—Shark, Dinosaur, Lucky Cat, Ladybug, Butterfly, Frog, and Lotus for animal and nature lovers. Pirate, Fairy, Mermaid, Ballerina, Fireman, Space Hero, Dragon Knight and Fireman for kids who dream big. Plus Dora the Explorer and SpongeBob SquarePants for kids who want to be their favorite characters. We believe in the power of imagination to make everyday families happier. Because a lot is at stake. More and more, children are forgetting how to create, to think, to explore, to connect. Over-scheduled, under-engaged, dulled by TV and video games, our kids are less and less able to amuse themselves, solve their own problems, or tell the difference between the character in the movie and the one trying to sell them cereal on TV. It's time someone said there's a better way. Someone like us. Someone like you. It's time that children and the adults who love them rely more on human beings for connection and guidance and entertainment instead of screens with shiny lights and buttons. It's easy. All it takes is someone who cares. And a little imagination. Won't you join us? What will you be? A ballerina? A ladybug? A dinosaur? A child with Kidorable rainboots is carried on the wings of imagination. Made from natural, waterproof rubber, our character rainboots for kids have imaginative designs to keep your little one playing. Kidorable knows that kids' rain gear needs to be warm, comfortable, & waterproof. We made these rainboots with durable rubber to keep toes dry & comfy, & cotton lining to keep feet warm. The non-slip rubber sole helps keep kids safe on slippery surfaces. Kidorable took rainboots & turned them into a dress up costume that kids will wear rain or shine. Sure to be the cutest rainboots wherever you & your kid travel. Add even more fun with Kidorable umbrellas, hats, rain jackets, backpacks, scarves & gloves. Fun & practical children's rainboots! If you're looking for a perfect back to school, birthday or holiday present for a kiddo, you've found it. Kids love Kidorable rainboots in any weather. Our rubber boots are great for little kids, big kids & toddlers.